Given the small size of the "vast throng," it probably would have been easier to write the returns on a chalkboard, or just yell them out the newspaper's window. But ah, the allure of technology. For hours on Wednesday night the large square in front of the Press Democrat office was thronged with hundreds of people. The crowd also thronged the Courthouse plaza. It was a large, interested throng, and during the evening cheers were frequently raised as the stereoscope the names and the votes of the candidates who were forging ahead on the large screen. For a number of years the Press Democrat has carried out this means of giving the election news to the public, and the effort has been greatly appreciated by everybody. As usual, the paper arranged a system of messenger communication with the various polling places, and the messages were hurriedly transmitted to the office and the slides were rapidly made. Frank Cherry used his fine stereopticon and gave excellent service. The crowd stayed until an early hour on Thursday morning, and the interest was maintained throughout. In addition to the stereopticon service, several hundred queries were answered over the telephone. "How's the election going?" was the favorite query asked and answered. Two more 1904 utility items: Another "electric juice" problem (see: "The 'Juice' is Off Again") and a gas pressure warning. On Feb. 26, the PD also noted the street lights were once again out, and "other lights very dim." 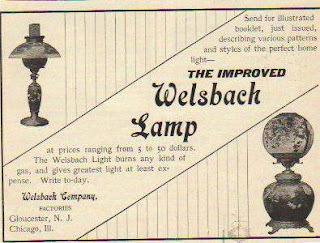 The Welsbach Company was the major manufacturer of mantle lamps at the time, popular because they produced such a bright light. The secret, we now know, was because the gauze was coated in radioactive thorium oxide. The old Welsbach factory grounds in New Jersey are now an EPA Superfund cleanup site. Several times Monday night the electric juice ceased to be juicy and went dead. The storm proved a great fuse blower. Shortly after one o'clock Tuesday morning the current went out presumably on account of trouble on the main line. Santa Rosa looked pretty black overhead and down below. The fluctuation of the current naturally caused the electric motors to fluctuate and the stops occasioned considerable delay in the printing office. Owing to a slight increase in pressure at the gas works to supply the demand for gas, consumers can keep down their gas bills by not opening the keys and valves on Welsbach lamps and stoves. Lighting and cooking bills can be reduced by attending to this. There is a surprise at the Novelty Theatre for Santa Rosans. The manager states nothing like it has ever been here and that each succeeding week will be ahead of its predecessor. Keep your eyes open for Monday night, he says, and also watch the comical moving pictures. The pictures will depict a policeman coming to arrest two servant girls. They resist, and set him down in a wash tub of soap suds, break dishes over his head and throw him out through a window. While engaged in blacking his shoes in the rear of C. A. Wright & Co.'s store on Thursday morning, George C. Day, the well known assistant in that store for many years, met with a peculiar accident. A varicose vein in his leg suddenly burst and he lost a considerable quantity of blood before it was staunched. With a towel wound tightly around the open vein Mr. Day went hurriedly to a physician's office and was given medical attention. He was then removed to his rooms, being very weak from the loss of life fluid. The vein had troubled him for several years and on account of this he had worn an elastic stocking. The strain of the bent knee while the shoe blacking was in progress caused the severing of the vein. Mr. Day's many friends hope that he will soon be able to resume his duties. He will have to rest easily for a short time. The accident on Thursday morning naturally alarmed him considerably. This 1902 reference to the Belvedere is frequently cited in mentions of turn-of-the-century Santa Rosa, so it's interesting to see what exactly appeared. The surprise was that the article also describes the next-door Paxton house, which allows us to date this lost Brainerd Jones masterpiece to 1901-1902. Also noteworthy is that contractors are named, but never the architect Jones. Neither did the Press Democrat mention Jones in coverage of the 1904 dedication of the Carnegie Library. Is this because contractors are hometown companies and Jones hailed from rival Petaluma? Or does it suggest that architects were held in lesser esteem? None of the other items in the complete article mention an architect, but almost always the contractor is identified -- and in one case, a "workman." Santa Rosa has had quite a building boom this winter. The sound of saw and hammer can be heard in all parts of town and every few days a new home is started in some part of our thriving city. This is good evidence of the fact that Santa Rosa is prosperous. A Press Democrat reporter took a run about Santa Rosa yesterday to ascertain how much building was going on at the present time. He found there were thirty-five dwellings in the course of construction or just completed. Nine business houses are going up and another was finished last month. One planing mill, a new maccaroni [sic] factory, three barns and four wood and coal sheds will also be soon completed. To this must be added the addition and improvements to the Santa Rosa Maccaroni factory of P. Bertoli just finished, and the handsome block which was started Saturday by C. C. Donovan. This is indeed a fine showing. Blitz W. Paxton has just finished his costly and elegant home on Healdsburg avenue with the help of Contractor Kuykendall. This is an elegant mansion and a big improvement to the city. Just across Carrillo street from the Paxton mansion is the large ten thousand dollar home of W.H. Lumsden, which with the Paxton home are the handsomest dwellings built in Sonoma county this year. Simpson & Roberts has the contract for Mr. Lumsden's house. A lady walking along Fourth street yesterday morning nearly had a serious fall as the result of slipping upon a piece of orange peel on the sidewalk. In at least a dozen places on Fourth street orange peel was noticed yesterday and almost any day the same thing can be seen. There is an ordinance providing punishment for the offense, and it is the intention of the police to enforce the same.